The Multi Pro® 1200 and 1250 turf sprayers are dedicated spray application vehicles equipped with a positive displacement diaphragm pump tied directly and proportionally to the speed of the vehicle. As a result, pump flow is automatically adjusted as vehicle speed changes, which allows the application rate to remain constant over a wide speed range. 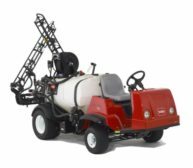 The Spray Pro control system is uniquely tied to the drive wheels and automatically adjusts to changes in ground speed to ensure constant application rate. The operator rides out-front for total visibility and control.